Water may be present laying beneath used cooking oil that is purchased for recycling. JK Controls developed a Water in Oil Detector with an LED indicator that illuminates as a probe passes through the oil/water interface. The probe was designed to be rugged to cope with a harsh operating environment and is battery operated to allow freedom of use. Click HERE for a PDF with further information. JK Controls have recently designed and built modern electronic Vector Meters to replace the original obsolete mechanical instruments in a Scottish power station. The Vector Meters can be setup using jumpers to take either 4 - 20 mA or 0 - 10 Volt input signals. The two input signals, mega Watts and mega VArs are galvanically isolated and displayed on a TFT screen mounted within the operators control desk. Original obsolete mechanical Vector Meter. Modern replacement electronic Vector Meter. Specialist remote inspection camera systems. For very low light inspection inside closed vessels we have developed a multi frame scanning camera system which integrates low light images to bring the final image to a level which will permit observation of detail for inspection. The cameras are encased to allow remote use in relatively harsh industrial environments. The images are displayed on bespoke operators consoles and recorded for quality and record keeping purposes. 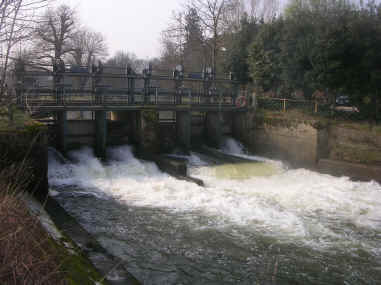 Multiple gate control of river levels. Typical example of automatic weir. In this application there are six vertical lift penstock gates set across the river and two on a bypass channel. The six main gates are individually controlled, each with its own electric actuator. The bypass channel gates are manually operated at times of extra high water flows. Remote control from flood defence office via PSTN telephony. Gates can be individually selected to Manual / Auto / Remote, and operated from central office computer systems. Any gates can be moved on manual demand from Remote or Local locations. Techniques to allow for time delays in PSTN when in Remote control. In Auto, gates open & close in a priority order. Priority order can be changed remotely, to distribute mechanical wear. Automatic resolution of conflict when priority is changed. Seamless transfer to new priority. Gate opening increment varies according to gate height, (High flow effect at small openings). When gate is clear of water surface gate continues to 100%. Several level deadbands and rate of change used to cope with flash floods. When obstruction by debris is detected, gate limits and control moves on to next gate in priority. Gate obstruction alarmed to central office. Obstruction limit release on reversal. Intruder detection and personnel time limits at site monitored and alarmed. Alarm to office when bypass gates need opening or closing. Software filters to minimize interference. Detection and alarming of implausible gate and river measurements. The client required a plant information display system to replace 34 individual paper chart recorders. Each virtual recorder has up to four pens providing a bar indicator and trend recording. Each recorder mimic screen is drawn to look as much like the original recorder it is replacing as possible. Information is displayed to the operator by twelve panel mounted 15-inch TFT screens mounted in three custom built pods. An additional screen is included for a stand-alone workstation that can be used on either unit one or unit two. The three pods are mounted on top of the existing unit desk. The plant information is gathered by a Mitsubishi Programmable Logic Controller (PLC) located in the unit control panel near the terminations for the existing recorders. The PLC has one hundred and six analogue inputs, plus spares. The plant information is fed from the PLC by an Ethernet link to a removable engineering workstation and three Scada PC's located in the pods. The Scada PC's are equipped with a four-screen driver card and each is provided with a desk-mounted roller-ball to control the displays. All the PC's run MS Windows NT4 (configured for networking and auto-logon), and a Mitsubishi MX2000 Client/Server Scada application configured to carry the complete Plant Recorder database and set of Recorder mimics. This enables redundancy in the event of any PC system failing. JK Controls Ltd have recently designed, manufactured and supplied drum level density compensation controllers for use in a Power Station. Each controller comprises two 4-20mA analogue inputs, one for differential pressure, ranging from 0 to 125 mBar, and the other for steam pressure, ranging from 1 to 201 barA. Both inputs are differential with a burden of 10 ohms and common mode isolation up to 40 volts. Two duplicate isolated 4 to 20 mA analogue outputs are provided for the drum level, ranging from –580 to +430 mm. These are fully floating self-powered at 30 Volts to eliminate ground loop. In addition four alarm output relays are provided indicating drum level HighHigh, High, Low and LowLow. Each can be individually set for alarm level and hysteresis via pushbuttons. The single pole changeover relays are rated at 120 Vac / 60 Vdc, 2Amp. An LCD is provided to indicate differential pressure, steam pressure, drum level and alarm status. Six external push buttons are provided to calibrate the current inputs and set alarms. Current outputs are set using onboard trim pots. A seventh button resets the programme in the PIC controller (Note: This does not affect values previously saved to the PIC’s EPROM). A push button on the front of the case will turn on the LCDs backlight temporarily. This can be set to remain on permanently if required using Jumper 1 on the circuit board. The power supply takes 100 to 240 Vac and its input is fused (1 AMP). We are specifying Control and Instrumentation services for balance of plant on new gas turbine generation equipment. JK Controls have recently designed, built and delivered monitoring systems for underwater sound projectors for Fish Guidance Systems. JK Controls are assisting a third party DCS vendor with configuration of operator workstation software and control logic. JK Controls are providing boiler control expertise to a large power boiler manufacturer for design and implementation of burner management and other control and instrumentation functions.